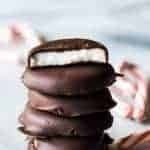 Homemade Peppermint Patties! Never buy these again! 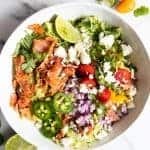 So easy to make, only a handful of ingredients needed! Perfectly cool peppermint center encased in decadent dark chocolate. One of my favorite things about the holidays is the abundance of peppermint. And one of my favorite peppermint treats is Peppermint Patties. So it was only natural I made my own! These are some of the easiest candies I have ever made. 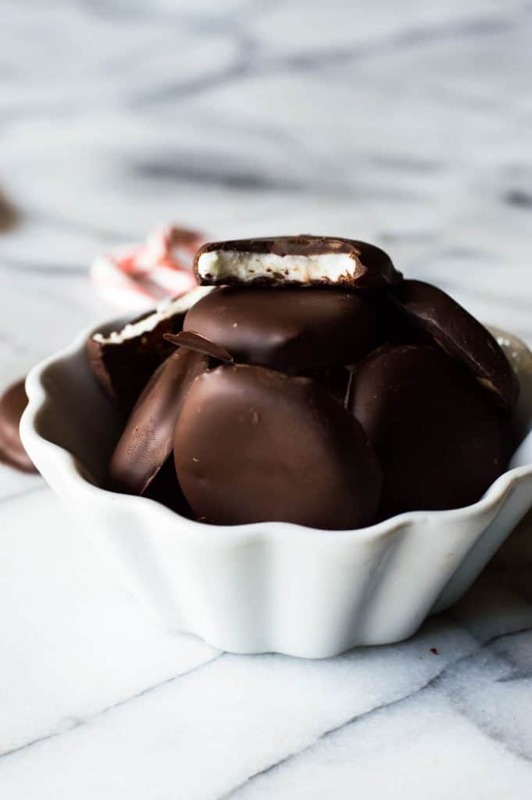 Just as easy as these Peppermint Truffles. The filling of these peppermint patties is super easy to make and comes together with only 3 ingredients. Sweetened condensed milk, peppermint extract and powdered sugar. The end result with be almost a dough like consistency. Roll it out just like you would a dough. I used a medicine cup to cut mine out. Super easy, simple, and most of us have one or twenty of those around the house or cluttering a cabinet. And it’s the perfect size, you want something that is going to make the patties about an inch wide. A quick dip into some dark chocolate makes these little patties complete. 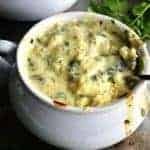 They taste even better than the ones you can buy, and the best part is that the recipe makes a rather large batch of them. Perfect for snacking on, or you can be kind and give some away as gifts. These are best kept in the fridge until eaten. 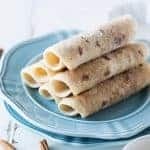 In a medium size bowl mix the sweetened condensed milk, peppermint extract, and powdered sugar together until thick dough forms. Sprinkle some powdered sugar on a flat clean work surface and place the peppermint dough on the sugar. Using a rolling pin roll out the dough to about 1/4 inch thickness. Using a medicine cup or other round object, cut out 1 inch circles from the dough. Place onto a wax paper covered baking sheet. 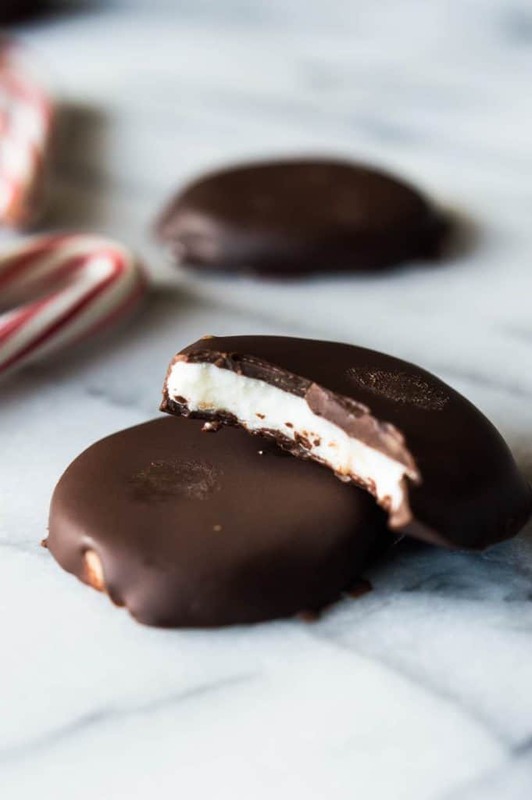 Place the peppermint patties into the fridge to allow to cool for about 30 minutes. Place the chocolate in a heat safe bowl. Add the oil. Heat the chocolate in the microwave in 15 second intervals until the chocolate is fully melted. Stir until smooth. 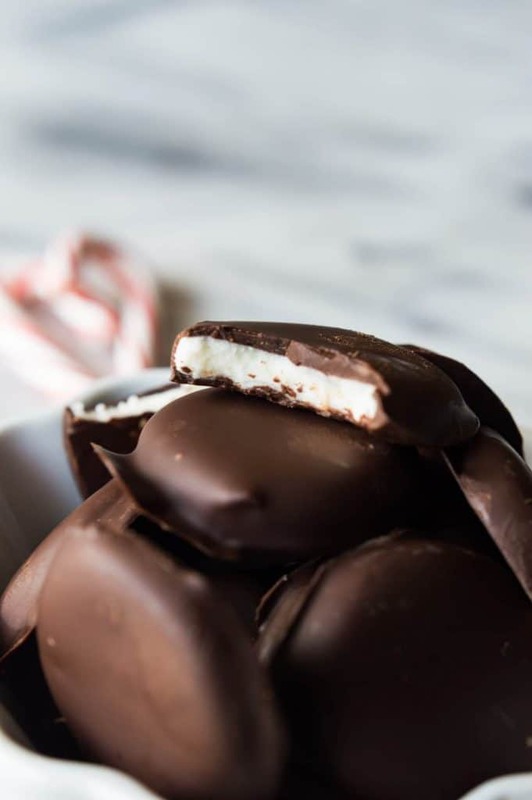 Using a fork dip the peppermint patties into the melted chocolate and place back on the wax paper covered baking sheet. Once all patties have been coated place the tray back in the fridge and allow the chocolate to set for another 30 minutes. Store the peppermint patties in the fridge until ready to be served! Enjoy! 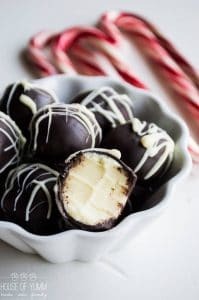 Don’t forget to check out these Peppermint Truffles too! 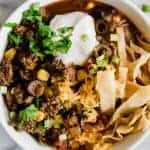 Only 4 ingredients needed! Yum!! What a great and easy candy for the Holidays? Love how much peppermint is in here! Omg! These are my favorite chocolate ever! I love peppermint just like you! YUM! Hi, I was just wondering how long these will last in the frig. (Of course that would assume they aren’t eaten. my question is, does the white center stick to the rolling pin and if so, what can I use to avoid that? I’m excited to make these today but not sure about the filling part. Thanks! I put cling wrap over the top that I’m going to roll over and it works wonderfully! Do you know how long these could last in the fridge? Just wondering how much in advance I could make them for Christmas! Can’t wait to try them! Hi Kim, I used vegetable oil, but you could also use some melted coconut oil. I made these and when I tried to cut them out they were melting. I put them in the frig. I ended up using a cookie scoop and by the time I finished scooping, they were flat. When I tried to put them in the chocolate, they melted off the fork. I cooled the chocolate and they still melted. Did I not use enough sugar? I followed your instructions and measurements exactly. Except I used peppermint oil. Only 5 drops of it. I just ended up pouring the chocolate on the sheet and put a disk on the chocolate then pouring enough on top to cover it. Looks very bad but taste very good. Thanks for any help. Hi Teresa! It’s possible the oil affected the consistency of the filling. Peppermint oil is a lot stronger than extract flavor wise, you might be able to get away with a little less oil. But I would think that if the filling is not firming up, especially in the fridge, add more powdered sugar to firm it up. Have you used Milk Chocolate instead? Can you use the chocolate bark squares ? Hi Iris. Was the dough too crumbly or too soft? It’s all in the balance with the wet ingredients to the dry. So if it’s crumbly you can add a bit more sweetened milk to the dough to soften it up and form a ball. Or if it’s too soft and seems like it’s melting then add more powdered sugar. Hope that helps! What type of. Chocolate do I buy .choc chips and melt or some other kind ? I took the dough and wrapped it around marachino cherries, then dipped in chocolate…YUM! What kind of dark chocolate are you using? Would it work with dark chocolate chips? I was just wondering what brand of dark chocolate you used ? Is it okay to use olive oil in the chocolate to melt it? This recipe didn’t work for me either, too dry even after I added a couple more ounces of condensed milk. Can you freeze these mints once they are made? If so, how long? Hi Karen. Yes! They can be frozen. 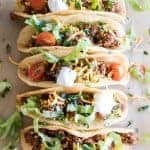 Just thaw them out in the fridge when you remove them to prevent condensation. They should be fine to be frozen for quite a while. Several months at least. Yes! The oil just helps the chocolate melt smooth and make it easier for dipping. What an easy recipe. I think I’ll try it this way then do other batches using different flavored extracts…orange would be great…coconut….cherry…..finished more Christmas baking and I’m done or I’d make these tonight, too, lol. LOL just saw the comment above mine saying the same thing…good thing I don’t read for a living. This was an excellent, simple recipe. I added a Ritz cracker under the peppermint layer. If you do that, make sure the wafers are about the same size as the cracker you use to make them look nicer. My first batch I made them a little smaller than the cracker and they weren’t as elegant. To the people who said the peppermint melted, you got the chocolate too hot. When it is almost melted, take it out of the microwave and stir it and all the bits will melt. The chocolate is melted but not really hot. BTW, I used chocolate chips. Several factors can play into why the dough it too soft or too crumbly. Powdered sugar can vary greatly in weight, depending on how you measure it. If you sift it before you measure, of you pack it or tap it to settle in the cup, can make a HUGE difference. Last I checked, 1 cup of powdered sugar weighs 120 grams, or about 4 ozs. Also the condensed milk brand will also affect the consistency. Some brands have more sugar in them, so they are not as ‘wet’ as others. Having dipped candy before, yes, the temp of the chocolate has to be low enough not the melt the center, but warm enough to stay liquid. Can you omit the oil in the chocolate? You can. It helps the chocolate to melt smooth and silky. But it’s not necessary. 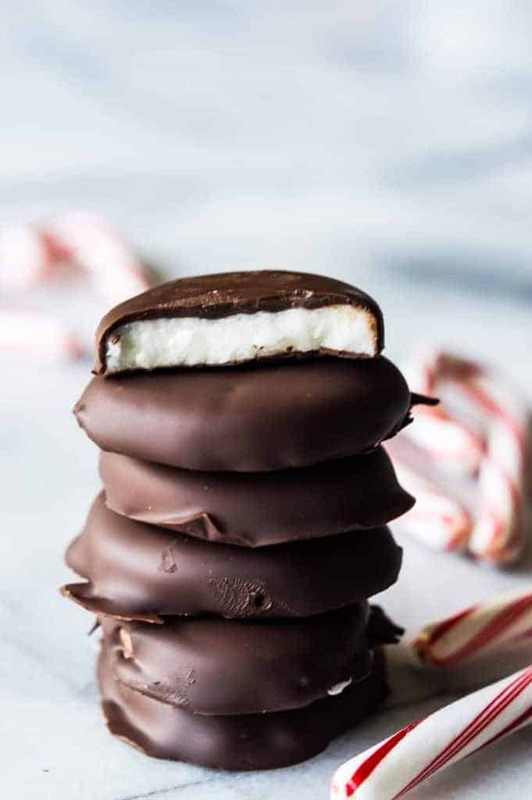 A word, from experience, when you make your holiday tins to give to people, make sure the peppermint patties are wrapped up in plastic or another tin because they will turn EVERY OTHER candy or cookie into a peppermint tasting treat…peppermint is powerful. Will these get what they call “bloom” on them? I made so many chocolate things and they always get that white stuff on them. I know it doesn’t effect the taste but it just doesn’t look good. I couldn’t find peppermint extract, but found mint extract…is that the same? Tried these today and have come out brilliantly, did have some trouble with the coating but think I had the chocolate too hot once I let it cool it became alot easier. Will be saving this one. Made batch of mint and a batch of lemon…woo Hoo! Great! Turned out amazing the first time I made these! I got tons of compliments on them when I handed them out at work. I’m making another batch right now and am separating a little to try out orange flavoring as well… hopefully just as yummy! I made these for Christmas and my family loved them. I’m on my 8th round of making these since Christmas. I know I will be making these a lot more. Store bought is a thing of the past. Thanks for sharing the recipe.